Rigid-hulled inflatable boats on the way! 12:00am EST - Another week for Rust development and we're seeing improvements to the new compass, Hapis puzzle progress, the launch of Rust World SDK, and a new type of boat entering the game! The newest form of water transportation in Rust has made its way onto staging. Rigid-hulled inflatable boats can now be spawned using the ‘spawn rhib’ command. At the moment, this is a rough implementation. That means boats are not spawning on their own around the map and there is no functionality for fuel consumption yet. That said, we do know some specifics. First, the boat seats a total of six people (one driver, four next to / behind, and one upfront). There’s also a small wood storage crate out front which holds space for 12 items. I’d say it’s a safe bet that we will see this fully implemented in game for the next forced wipe on July 5th. Expect more functionality and details coming to light over the next two weeks. Edit: It does look like these will be piloted by scientists and gained by players through killing said scientists. After adding the initial compass functionality last week, Helk has improved on it over the past few days. Along with adding the ability to toggle the compass hud view on and off in the escape menu, he’s added the ability to have it be toggled on and off with a shortcut key ('c' by default). Players will now be able to choose whether the hotkey only displays the compass while holding it down or they can select to have clicking the 'c' key just toggle the compass on and off. Alistair has continued his work on adding monument puzzles to the Hapis Island map. Although we have no visuals on this yet, we can expect similar puzzles to those on procedural maps come the next forced wipe. Exciting news in the realm of custom maps, the Rust World SDK has officially been released on github. Although it doesn’t come with any map editing tools, it is expected that members of the community will soon create map editors utilizing this SDK. As always, we will keep you posted on further developments. The Rigid-hulled inflatable boats don't appear to be the only new watercraft coming to Rust. We’re also seeing a lot of work on paddle hold types, in preparation for a canoe and paddle. Although neither of these are in game yet, it does appear they soon will be. Damian continues his work on the newest monument, Bandit town. 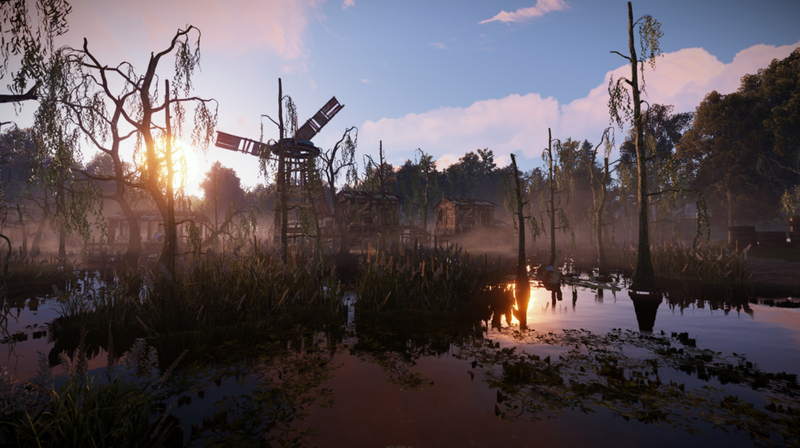 This week he's done various tweaks and optimizations along with working on the cabins and tree's for this new swampy monument. I reached out to him for some teaser shots and will post them if he sends any. Fix Junkpile Scientists not registering with Junkpiles properly.